From the author of Circle of Secrets comes a moving, magical adventure filled with family, faith, loss and love. Tara Doucet’s life is a sham. She lives in one of the most prestigious homes along the bayou of Louisiana, but her father left them, her mother hides in the south wing of the house crippled by melancholy, she has nothing in common with her older sister Riley, and her beloved Grammy Claire has just passed away. Then the butterflies come and begin to follow Tara around. A strange butler appears at their door to take them back to Grammy Claire’s house on the island of Chuuk, and she finds a stack of keys and detailed letters from her grandmother with a mystery to solve. As she learns more about her grandmother’s life, she knows the truth will change her life forever. Circle of Secrets is one of my favorite books. When I learned Little had a new book coming out in 2013, I asked her for a copy. She graciously sent it my way, and then my life got crazy. Determined to catch up on overdue reviews this year, I brought When the Butterflies Came with me on vacation. Now, I am kicking myself for not reading it sooner. What a fabulous book! Filled with mystery and magic, and set against the beauty of the bayou and an isolated island filled with secrets, Little has created an engaging adventure-filled story. Tara is the perfect protagonist–one readers will sympathize with and cheer for from the very beginning. Her troubled life unfolds as she discovers more and more about the grandmother she thought she knew. As she gets closer and closer to discovering Grammy Claire’s secrets, the danger increases until she’s not certain who is friend or foe. The ending will both thrill and shock. With When the Butterflies Came, Little solidifies her place in children’s literature. Her masterful storytelling will draw you right in and hold you tight until the last page is turned. Welcome to the February edition of From the Family Bookshelf. But first of all, Happy Valentine’s Day! Every year we celebrate this holiday dedicated to love. If you’re interested in learning more about the legend of St. Valentine, you can visit history.com. Pandora’s Temple by Jon Land, an exciting thriller that plays “what if” with an ancient legend. I’m currently in the middle of Executive Command by Gary Grossman. I’ve read the other two novels in this political thriller series. I’m sure I’ll enjoy this one. Poor Dad is working so much lately, it’s rare he has time to read. Hopefully that will change soon. As I mentioned last month, I am reading The Eleventh Plague by Jeff Hirsch with the Lil Diva (11) and the Lil Princess (9). It’s slightly too old for them. There’s some kissing going on and they are still at the “kissing is yucky” stage, but overall it’s a fascinating story. The conflict is going to be ramped up now and could end in a disastrous way, so I’m eager to keep going. After we finished reading the latest Dork Diaries book, we moved on to Diary of A Wimpy Kid: Third Wheel by Jeff Kinney. The girls loved it. I was rather cool on it. Greg Heffley never changes. He never learns anything. He’s pretty much just a self-centered boy. Not unrealistic, but annoying to me anyway. 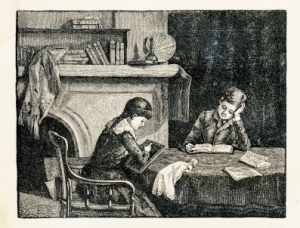 Now we are reading Emma Dilemma, the Nanny, and the Wedding by Patricia Hermes. We’ve all enjoyed it so far. Emma and her brother Tim are nervous and less than enthusiastic about their nanny, Annie, getting married. Changes aren’t easy for them, which I think is true of many kids. We’re reviewing this for the Amazon Vine program. 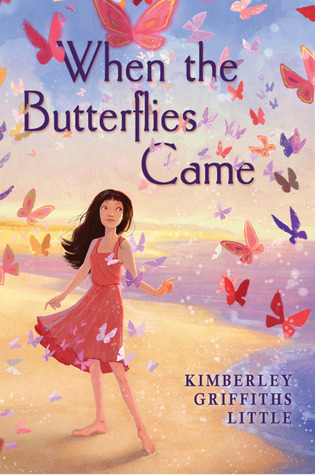 I am also excited to say that Circle of Secrets author Kimberley Griffiths Little has a new book coming out in April, When the Butterflies Came. It can be pre-ordered at Amazon. She will be sending the girls and I an ARC of this book to review. We’re very excited, as we absolutely loved Circle of Secrets. That’s it from our neck of the woods. Hope you’ve read some great books this past month. When her father takes a temporary job in Russia, Shelby Jane is sent to live with the mother who abandoned her family a year ago. Angry and feeling alone, she’s certain living in the heart of the Louisiana bayou is going to be miserable. Tormented by her classmates, Shelby is relieved to find a friend in Gwen, a mysterious girl living by herself on the bayou. As events unfold, Shelby wonders if Gwen is tied to the blue bottle tree near her mother, Mirage’s house. Painful memories prevent Mirage from talking about the past, and Shelby is still too hurt to talk to her mother about all that is happening. As the past and present collide, can Shelby and her mamma break through the pain of the past year to heal their hurts? 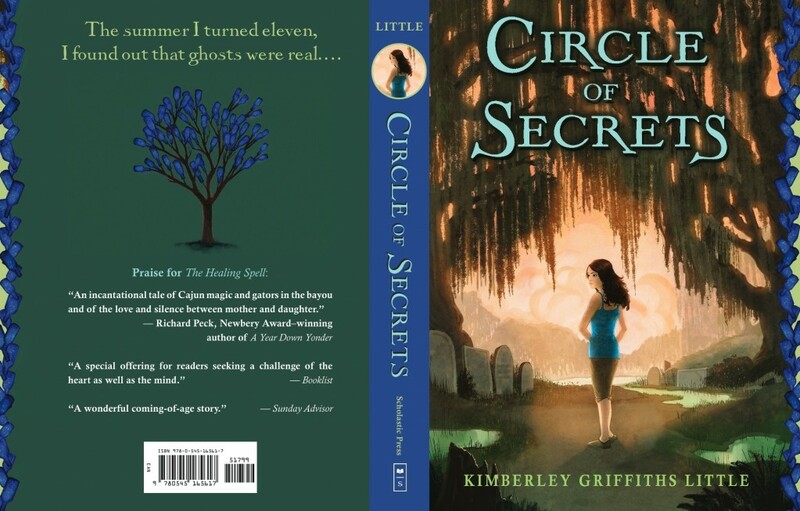 Circle of Secrets by Kimberley Griffiths Little is a family drama filled with secrets, mystery and ghosts of the past. In this haunting tale, Little has blended a superb plot, rich descriptions and well-developed characters to come up with a page turning middle grade novel. The Lil Diva (10) purchased this book at a Scholastic book fair this spring. She loves mysterious stories, and this seemed like it would fit the bill. It also helped that the book came with a charm bracelet. For me, Circle of Secrets started off a bit slow. I wasn’t truly captivated by the story until some of the pieces started to fall into place. Young people, however, will find Shelby Jane a relatable character whose strained relationship with her mother propels the plot forward during the first half of the book. Shelby is dealing with her anger over Mirage abandoning the family. She certainly has no desire to live with her, but it’s entirely out of her control because her father is temporarily out of the country. This speaks so well to how a young person can feel about the lack of control she has over her own life. From the time Shelby first meets Gwen, mystery surrounds the girl. The more time they spend together, the more questions Shelby has about Gwen’s ties to the blue bottle tree behind Mirage’s house and why her mamma refuses to go near it. What I truly like about this book is how well Little tied the past to the present, and sometimes in unexpected ways, like the similar games played by kids at Shelby’s school and back when Mirage was growing up. Little ties everything up in a nice, big mysterious bow, and the reader is eager to pull the ties and open up a fabulous story. The Lil Diva and I read this together as part of her reading requirement for the library summer reading program. She loved the book, and I wouldn’t be surprised if she read it over again at some point. We purchased this book at a school book fair. No review was expected. This review contains my honest opinions, for which I have received no monetary compensation.